Home / Fragrance / Will the real Miss Dior please stand up? Will the real Miss Dior please stand up? This has to be the most gorgeously, stunningly, dramatically beautiful perfume advert of all times. Pretty pink roses, innocent jasmine, seductive orange blossoms and swathes of satiny black ribbons twirl and bloom to form the emblematic icons of Christian Dior before transforming into the new flacon of Miss Dior, all set against the haunting Roosevelt Blues. It’s 1 minute and 16 seconds of pure bliss! And it is this fabulosity that makes me wonder why I don’t own a single bottle of Miss Dior. Despite it’s classic legacy. And it’s pedigree. And the gorgeous visuals. Maybe it’s because this perfume has managed to confuse even the most stalwart fragrance aficionados with it’s constant reissues, name changes, colour shifts and olfactory reinterpretations. In fact, there are whole sites devoted to figuring out which of the approximately 15 versions is the real deal. I am not kidding! My first experience of Miss Dior was a half-filled bottle of the very first version, created by Christian Dior himself in 1947. Its youthfulness, sophistication and elegance shone through the transparent glass amphora, whose fluid, feminine lines echoed the New Look silhouettes, made famous by the couturier-perfumer who lengthened skirts, belted waists and perked-up busts. “I created this perfume to surround every woman with an exquisite femininity, as if each of my dresses, one by one, emerged from the bottle,” he declared. The beautiful classical chypre with its green, floral and woody notes, became an instant legend. The romance had begun. Then, as the couturier was developing his Verticale collection during the 1950s, he transformed the lines of Miss Dior, envisaging a bottle “cut like a suit”: architectural, geometric and sober. For the first time, the glass was engraved with Monsieur Dior’s signature houndstooth motif and its neck tied with a couture bow. Decorative, feminine and timeless, the bow acted as a link between couture and perfume and from that moment onward it would never leave Miss Dior’s neck. But that was destined to be the only constant. 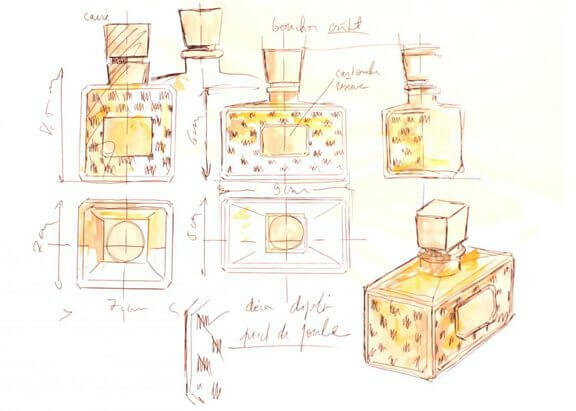 In time, this iconic perfume was transformed through 13 editions. Unfortunately, none of the later “updates” (13 of them! ), most of which were called Miss Dior Cherie, caught my fancy even one bit. In fact, I found most of them pretty insipid. The lowest (or highest – depending on whether you liked classic, sophisticated perfumes or kitschy, rock child ones) point came in 2005, when Christine Nagel worked with John Galliano to create an over-the-top-sweet candy shop vibe with notes of strawberry leaf, violet, jasmine, caramel popcorn, wild strawberry sorbet, musk and patchouli. Even though his intentions seemed logical (“As fashion evolves so must its scent…”), it did not translate well. And the model said it all: Riley Keough, Elvis Presley’s granddaughter, and the embodiment of the blonde party girl who DEMANDED attention. The House of Dior was no longer about subtle beauty – it wanted to jump out and grab you by the neck. Finally, in 2011 the Miss Dior Cherie perfume line was renamed to simply Miss Dior, while the original (and legendary) Miss Dior was renamed Miss Dior Originale (confused yet?). The purpose, I am assuming, was to distance the House’s founding perfume from the less charming follow-ups. At this time, Nagel’s version of Miss Dior Cherie was reformulated by Francois Demachy (and renamed as Miss Dior). It was, thankfully, not as shrieky as the Nagel version – evolving from the young party girl with a bag of pop corn in hand to the refined Natalie Portman. It sparkled with the ultra-feminine cadences of Italian mandarin, jasmine and patchouli… elegant and spirited with a touch of impertinence. [This is the fragrance in the animated advert above]. The juice worked but the main fallout was supreme confusion. What am I to buy? Is the Miss Dior sitting on the shelf the original Miss Dior (classic and elegant) or is it actually Miss Dior Cherie (overtly young and loud)? 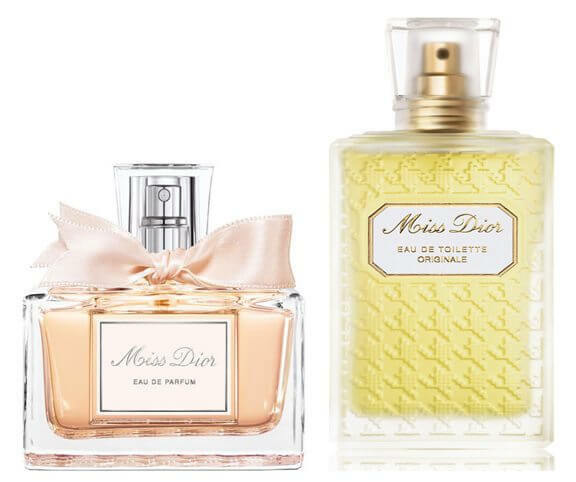 Or is it one of the numerous variations of the latter – Miss Dior Cherie Eau de Printemps (2007), Miss Dior Chérie Blooming Bouquet (2008) and Miss Dior Chérie l’Eau (2009). At one point of time, you would find hopelessly lost customers wandering the aisles looking for “that salmon coloured bottle with white writing and white ribbon” or “the coral bottle with a silver bow” for lack of knowing what was what at any given time! Now it’s 2012 and Raf Simon, the new Creative Director of Dior, is bringing back the elegance, the prettiness, the femininity, the grandeur, the graciousness that was the hallmark of Christian Dior’s original creations. And in keeping with this vision, François Demachy has rewritten a ravishing sequel to the classicism of Miss Dior (the original one from 1947). Called Miss Dior Le Parfum, this heady scent is steeped in sensuality. 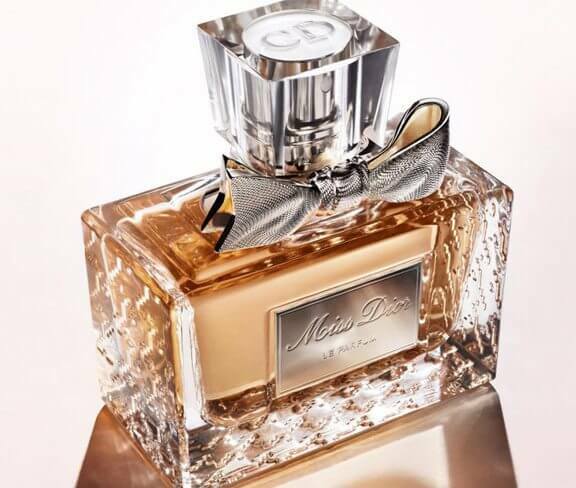 Denser and more mysterious than its previous interpretations, it is as sumptuous as an evening gown and amplifies the oriental facet of Miss Dior (again, the one from 1947), emphasising its sophistication. “I wanted to bring something precious and luminous to the composition, like an oriental jewel or the shimmer of a moiré silk,” explains Demachy. So, just like haute couture dresses, exceptional raw materials give a touch of majesty and desirability to the perfume while the chypre olfactive architecture plays the role mounting does in a gown, giving structure to the formula. The result? The highly concentrated Miss Dior Le Parfum features a sensual blend of Italian mandarin essence with Turkish and Bulgarian Rose absolutes. The floral top notes are underscored by an elegant combination of amber swirled together with a noble, enhanced patchouli, while a sweet and smooth vanilla adds a sensual dimension to this new, oriental accord. Swathed by a precious bottle crafted to resemble a skirt suit and topped off with a couture metallic bow, each whiff offers a heady and intoxicating glimpse into a realm of absolute sophistication and elegance. In short, if the original Miss Dior was the perfume of a pretty Parisienne – an elegant young woman full of vitality and seduction – with Le Parfum her character has evolved to a more intense sophistication and sensuality. And yet there is an element of playfulness, facets of mischievousness and a youthful vitality that makes it so very wearable in the 21st century. I see it as the perfume for special nights, when you want to make an impact – the nights when you would be dressed in haute couture gowns by Dior if that age still existed. Though, come to think of it, I would also wear it during the day when I want an extra boost of glam confidence – though sparingly. And at US$82 for 40 ml, I can bet that you won’t run into a whole bunch of people dressed in the same fragrance (which is always something of a buzz killer for me). But coming back to the subject of confusions – as far as I have understood, there are now three versions of Miss Dior: Miss Dior Originale (this is the one from 1947), Miss Dior (the original Miss Dior Cherie) and Miss Dior Le Parfum (the just-launched version created by François Demachy in 2012). Am I right, Dior? Or is there another bit of this complex tapestry that I have not yet untangled? Someone please help as I am dying to pick up a bottle! Miss Dior Le Parfum remains the incarnation of youth and vitality, as personified by Nathalie Portman in a backless dress, her arms full of roses – the very definition of mischievous romance. Thank you!! My favorite scent, the Miss Dior from 1947, that I have lived without for twenty years because I was told it was discontinued, is now available to me again!! Thank you so very much for clarifying this for me!!!!! !